We have hired expert warehousing personnel who keep a stringent check on the entire range of stored lot ensuring zero damage to the products till the final dispatch to the clients. As we promise to offer quality approved products to the clients, we make use of only high-grade raw materials selected from one of the best sources present in the market. 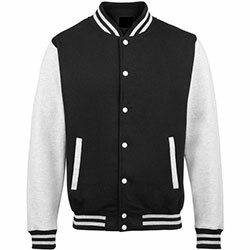 WB-1903 Varsity Jacket is made of the finest quality fabric and is available in different color options.